Casper, you were one of our very first Blogging friends and you set the standard for gentle life focused on family and love. Your time with us was not long enough but we understand that you are healthy and young and waiting for when we join you. We will never forget you and you shall always hold a very special place in our hearts. We promise to wrap our paws and arms around your mommy and daddy during this painful adjustment, hopefully they can find some comfort in knowing that we share their loss and want them to smile again. May you guide them to peace, sweet friend. Funny we thought about you only yesterday wondering if things were OK! We are so so sorry and we feel for you. Sending big love and good wishes. Yours Molly so saddened by the news. I just wanted to say that I am so sorry for your loss - Casper left us way too soon. Take comfort in knowing that you and Casper touched many lives with your blog, and that we all share your pain in these difficult days. Keep him close to your heart, where memories of him will reside forever. Casper came into our lives, left his paw prints on our hearts and we will never forget him. 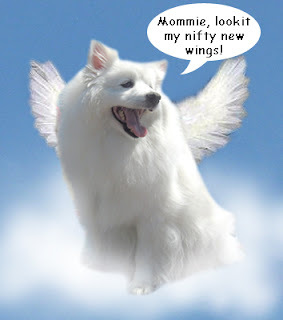 We read Casper's blog over the years, my eskie Roswell never commented, being a dog of few words. When Ros died, reading about Casper's adventures really made me feel better. I loved the pictures of him making cookies, wearing his sunglasses, and being obviously such a really happy boy. I have read Casper's blog over these last few years, never failing to be captivated by his beautiful Eskie 'grin'. Always such a cutie, right up until the end. I am so sorry to hear about his passing over to the Rainbow Bridge, and I extend my sincere condolences to Casper's family, and all of those who loved him. So sorry to hear about Casper. He had an indomitable spirit. Rest in peace sweet boy. Casper my buddy! Just dropping by to visit your blog. How come there are no recent posts?! 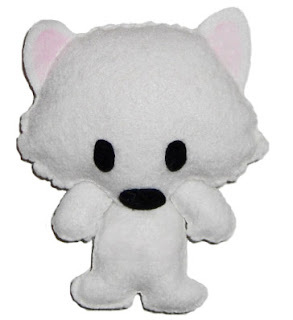 We need more Eskie bloggers. Woof! RIP sweet Casper. You will never be forgotten. Even after all these months, I think of you often. You sure made this sad world an infinitely better place.